Astronomers have found evidence for a companion star that survived the blast of a supernova explosion. Chandra's X-rays reveal a point-like source within the debris field produced when a massive star exploded. This system contains either a neutron star or black hole and a surviving massive star. The supernova remnant is called DEM L241 and is found in the Large Magellanic Cloud, a small neighboring galaxy to the Milky Way. When a massive star runs out fuel, it collapses and explodes as a supernova. Although these explosions are extremely powerful, it is possible for a companion star to endure the blast. A team of astronomers using NASA's Chandra X-ray Observatory and other telescopes has found evidence for one of these survivors. This hardy star is in a stellar explosion's debris field - also called its supernova remnant - located in an HII region called DEM L241. An HII (pronounced "H-two") region is created when the radiation from hot, young stars strips away the electrons from neutral hydrogen atoms (HI) to form clouds of ionized hydrogen (HII). This HII region is located in the Large Magellanic Cloud, a small companion galaxy to the Milky Way. 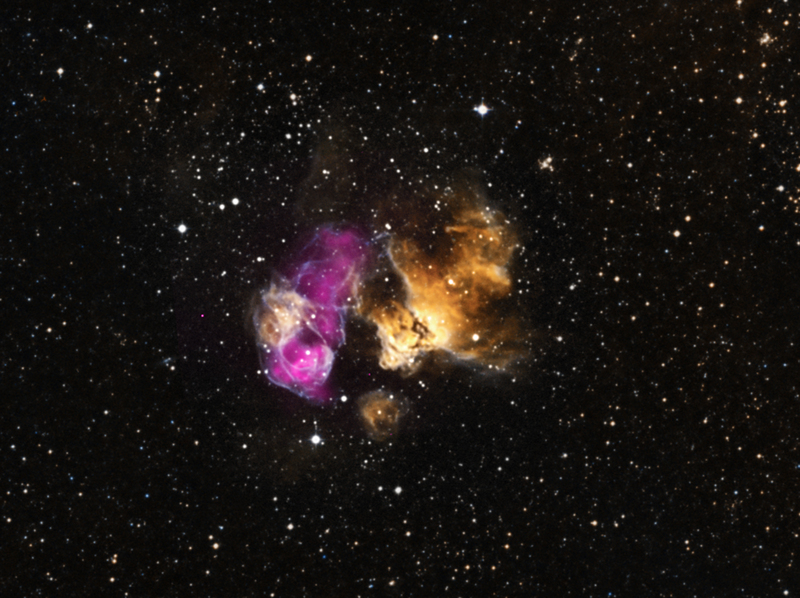 A new composite image of DEM L241 contains Chandra data (purple) that outlines the supernova remnant. The remnant remains hot and therefore X-ray bright for thousands of years after the original explosion occurred. Also included in this image are optical data from the Magellanic Cloud Emission Line Survey (MCELS) taken from ground-based telescopes in Chile (yellow and cyan), which trace the HII emission produced by DEM L241. Additional optical data from the Digitized Sky Survey (white) are also included, showing stars in the field. Astronomers can look at the details of the Chandra data to glean important clues about the nature of X-ray sources. For example, how bright the X-rays are, how they change over time, and how they are distributed across the range of energy that Chandra observes. In this case, the data suggest that the point-like source is one component of a binary star system. In such a celestial pair, either a neutron star or black hole (formed when the star went supernova) is in orbit with a star much larger than our Sun. As they orbit one another, the dense neutron star or black hole pulls material away its companion star through the wind of particles that flows away from its surface. If this result is confirmed, DEM L241 would be only the third binary containing both a massive star and a neutron star or black hole ever found in the aftermath of a supernova. Chandra's X-ray data also show that the inside of the supernova remnant is enriched in oxygen, neon and magnesium. This enrichment and the presence of the massive star imply that the star that exploded had a mass greater than 25 times, to perhaps up to 40 times, that of the Sun. Optical observations with the South African Astronomical Observatory's 1.9-meter telescope show the velocity of the massive star is changing and that it orbits around the neutron star or black hole with a period of tens of days. A detailed measurement of the velocity variation of the massive companion star should provide a definitive test of whether or not the binary contains a black hole. Indirect evidence already exists that other supernova remnants were formed by the collapse of a star to form a black hole. However, if the collapsed star in DEM L241 turns out to be a black hole, it would provide the strongest evidence yet for such a catastrophic event. What does the future hold for this system? If the latest thinking is correct, the surviving massive star will be destroyed in a supernova explosion some millions of years from now. When it does, it may form a binary system containing two neutron stars or a neutron star and a black hole, or even a system with two black holes. A paper describing these results is available online and was published in the November 10, 2012 issue of The Astrophysical Journal. The authors are Fred Seward of the Harvard-Smithsonian Center for Astrophysics in Cambridge, MA; P. Charles from University of Southampton, UK; D. Foster from the South African Astronomical Observatory in Cape Town, South Africa; J. Dickel and P. Romero from University of New Mexico in Albuquerque, NM; Z. Edwards, M. Perry and R. Williams from Columbus State University in Columbus, GA.
Coordinates (J2000) RA 05h 36m 00.00s | Dec -67° 35´ 09.00"
Fascinating. I remember when Chandra first launched aboard shuttle, lots of PR over Cmdr. Thanks for allowing us to share in these magnificent discoveries. A star cannot survive the supernova blast, being run out of fuel and energy, the blast is enough to bust it out. I am Marvin L. S. and will be using my full name Marvin Lee is my Southern double name. My question is what was it that this star was able to survive the blast from the Supernova? This was exciting to read and view. 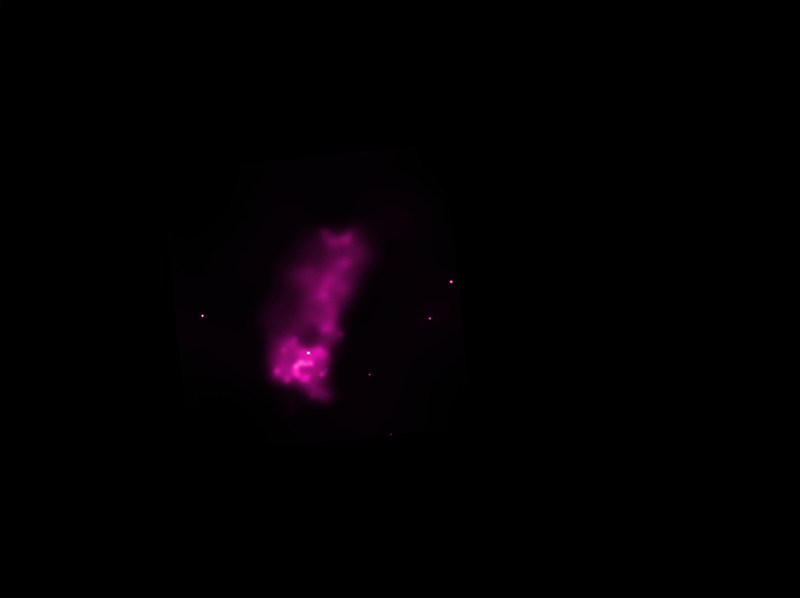 Combining X-rays from Chandra with optical data from the Magellanic Cloud Emission Line Survey and Digitized Sky Survey. X-rays are magenta, optical red, green and blue. In the constellation Dorado, visible in the Southern Hemispheres.